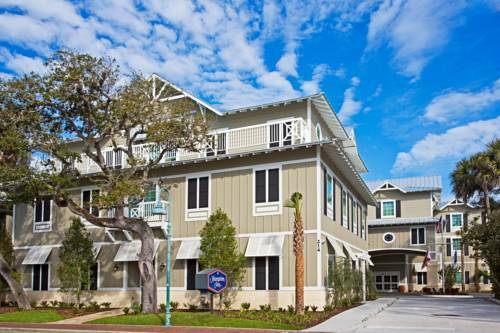 Hampton Inn New Smyrna Beach an AAA three-diamond hotel is located minutes from 13 miles of white sandy beach. The city offers a laid back coastal town to those who visit. New Smyrna Beach features an ideal blend of outdoor recreation shops marinas restaurants and a thriving arts district. The city is bordered on the south by the Canaveral National Seashore Park and to the east by the Atlantic Ocean. The hotel features spacious rooms. Guest can request rooms with either a king size bed rooms with two queen beds or a spacious suite. All rooms come equipped with wireless high-speed internet access and free hot breakfast in the morning for all guest. The hotel has two meeting rooms averaging 900 square feet each. Each meeting room has wireless capabilities. Each meeting room is equipped with a flat screen TV a projector and a screen. The hotel has an outdoor pool. The pool is a saline in keeping with the hotels green status. The hotel sits just over the bridge from a thriving business district and minutes from one of the best teaching hospitals in Florida. If coming in for the Daytona Speedway the hotel is close enough you can hear the cars as they round the last turn heading down the straightaway. All reservations must be guaranteed with a major credit card or advance cash deposit to hotel regardless of time of arrival. All reservations must be cancelled 24 hours prior to arrival host time unless deposit is required. Policy is subject to change. All reservations must be cancelled by 24 hours prior to arrival host time unless deposit is required. If this reservation has been made electronically please cancel it electronically to avoid confusion and a no show bill. Policy is subject to change. Fresh seafood cold drinks and good friends. Family restaurant featuring a wide selection of Mexican fare. ~35 miles from New Smyrna Beach. ~64 miles from New Smyrna Beach.